Does your driveway have cracks in it? Are you in need of paving repairs? Or do you simply need a new paving job completed? Duval Paving, LLC has been offering superior paving services to homeowners and business owners since 2011. Our experienced pavers strive to provide superior quality products, detail-oriented services, and outstanding customer service, no matter how large or small the job. Whether it's asphalt paving, concrete paving, or stonework, commercial or residential paving, you can count on Duval Paving, LLC to provide you with fully satisfactory results, giving your property the "Wow" factor it deserves! Having a beautifully constructed driveway, sidewalk, or patio plays an integral role in the overall curb appeal and value of your home. This is why Duval Paving, LLC is the paving company you can trust to enhance your home's curb appeal and value. With our experienced staff and outstanding work ethic, you will have a fantastic looking property in no time. The parking lots of a commercial property is the client's / customer's first impression. Make the first impression last by having a professional, well maintained, well-constructed parking lot and walkway. Having been in business since 2011, Duval Paving, LLC has the expertise in large paving jobs. 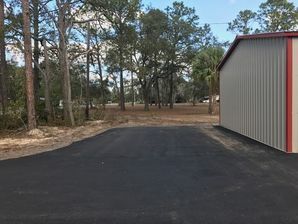 Call (904) 201-2161 for the paving contractor you can trust to give you a flawless parking lot on your commercial property.